The International Society for Oral Literature of Africa (ISOLA) has held a 3-day conference, the first of its kind in Nigeria, hosted by the faculty of Arts, University of Ibadan. The event took place at the Conference centre, University of Ibadan Hotels on Tuesday, 10th July to Thursday to 12th July. After the welcoming address by the co-hosts, Prof. Dasylva, Dean of the Faculty of Arts and the President of ISOLA, Prof. Chiji Akoma, the audience was entertained with the distinct dancing steps of the Udje Urohobo dance troupe. The audience also comprise French-speaking audience and so the lectures were delivered in the two languages, the English and the French. The opening lecture with the theme ‘Oral Literature and Festivals in Africa and the African Diaspora: Tradition and Globalization ‘ was delivered by two keynote speakers in person of Emeritus professor Egbiegberi Alagoa of the University of Port Harcourt and Tail Tamari, a senior research fellow at the Centre National Dela, Recherche scientifique, Paris. 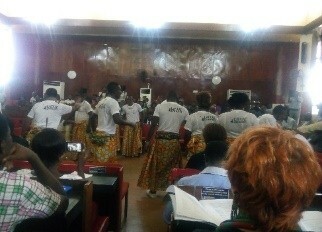 After the lecture, and a short tea break, there were plenary sessions where lectures on oral literature were discussed in respect to African culture, the oral traditions, folklore, rituals and the like. It was no doubt a melting pot of social interactions.